There’s only one thing that can be sure in ORA-12514, which is: The target listener is up and running. That is to say, the listener is reachable. Let’s see how we get ORA-12514. First of all, we have to make sure the listener on the database server is reachable by using tnsping. OK, the remote listener is up and reachable. Please note that, the message of successful tnsping did not indicate that the service name is existing on the remote listener. Next, we test the connection to the database by sqlplus (SQL*Plus). 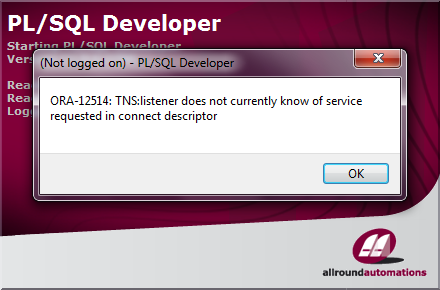 The database was not available or say idle, no any dynamic services registered with the listener. That’s why we saw ORA-12514. The service name of the connect descriptor in tnsnames.ora did not match the service name in the listener. That is to say, the listener does not currently know of service requested in connect descriptor. If the database instance is up and running, the service name may not registered with the listener at specific port as you thought. By default, the service port of listener is 1521. But sometimes, it could switch to another port, say 1522. Please note that, ORA-12514 is an error threw by the listener specifically for the client side. The database is no way to know such problem. If there’s no instance, then no service name will register with the listener. You should startup the instance, then LREG will register the service in 60 seconds. If you are sure that the database is up and running and still got ORA-12514, things may be complicated. Let’s keep looking for other solutions. The service name in the connect descriptor of client’s tnsnames.ora shall match the service registered in the listener. Sometimes, it’s just a typo problem. In short, the service names of the following 3 parties should be matched with each other in order to solve ORA-12514. We talk about them respectively below. The question is: where is tnsnames.ora in Windows platform? It is usually at TNS_ADMIN, an environment variable contains the location to the network configuration files in Windows platforms. In case that you have no way to query the database, you can make a guess. Usually but not always, the service name is the same as the database unique name (DB_UNIQUE_NAME). The database unique name is the same as the instance name ($ORACLE_SID) for a single-instance database. 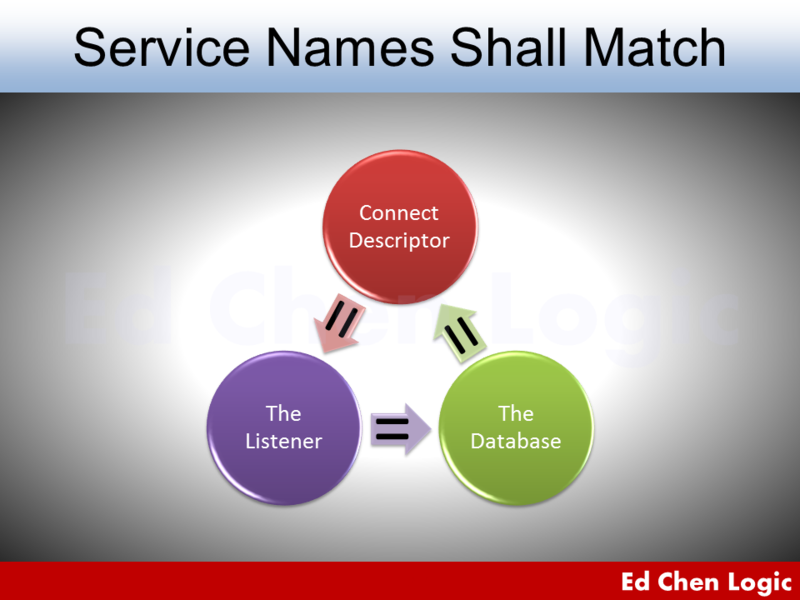 If both service names in the client and database are matched, but the listener showed a different service name or “The listener supports no services“. The database may register a different listener, let’s keep reading this post. Sometime, we may go for the wrong destination of the listener, either host or port was incorrect. As a result, we saw ORA-12514 because there’s no matched service name with that listener. We should check the host and port in the connect descriptor of the TNS name. Chances are, the correct hostname may be resolved as the wrong IP address by DNS. Consequently, connections took us to the wrong database server. This could happen when we switched from an old machine to a new database server. So we should focus on name resolution problem first. For confirming that ORA-12514 is caused by name resolution, we should use the IP address instead of hostname to connect the database for clients. Additionally, DBA should also check both values of HOST and PORT in listener.ora. During the troubleshooting on the name resolution, you might see TNS-12545: Connect failed because target host or object does not exist temporarily. The instance may register with the another listener which services whatever port other than 1521. Consequently, no service name is supported by that listener. That’s why we always see ORA-12514 only in clients or TNS-12514 in the listener’s log, the database instance can never know such problem. If the default listener at port 1521 in the same machine is used, the value could be empty. Otherwise, we will see the listener description like the above. In a very rare case, the database uses a remote listener to register its service names. This is what Class of Secure Transports (COST) fights against. 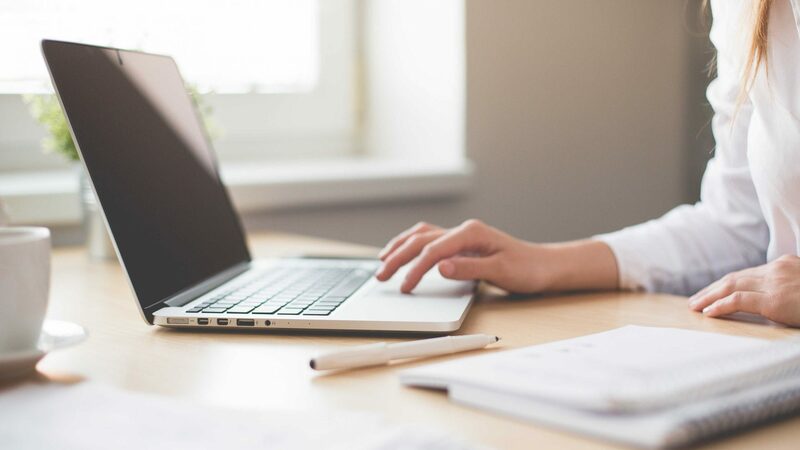 For more troubleshooting beside ORA-12514, you may refer to Oracle 18c Net Services Administrator’s Guide: 15 Testing Connections. It’s pretty easy to explain why you got ORA-12514 when you restart a database. Please compare the following two cases. We saw ORA-12514 after we tried to startup the stopped database. Here is the reason: When you shutdown the instance, you lost the connection from the database and the service was unregistered from the listener, no more service information of the database on the listener. Therefore, ORA-12514 notified that you can’t do any further to this database by this way. To solve ORA-12514 thoroughly, you should add a static service registration to the listener for your database. Otherwise, you have to connect to the database by OS authentication. Let’s see how to avoid ORA-12514 if you are going to do critical jobs like shutdown or startup database through OS authentication. You don’t have to provide the password when the console prompts, just press Enter and keep going. Can you tell the difference? By this method, you can never lose your connection during down time no matter the listener is up or not. No ORA-12514 interrupts you. By the way, I talked about how to connecting an idle, NOMOUNT or RESTRICT database from remote clients in another post. It may help you to clarify some concepts about ORA-12514. Operation requires a connection to instance "primary" on database "standby"
Operation requires startup of instance "primary" on database "primary"
The former standby is up and now playing the primary role. The former primary is down and going to play the standby role, but the data guard broker is unable to mount the instance due to the lost contact. As a result, we saw ORA-12514 in DGMGRL. That is to say, the switchover is incomplete, but it does not mean a failure. This is because the former primary database is down and the broker lost the contact that caused ORA-12514. Here are the actions that you have to take in order to complete the switchover. Please start up and mount the former “primary” database manually. After that, the data guard will automatically synchronize the data so as to complete the switchover. The preventive action to ORA-12514 in an incomplete switchover is to add a very special static service in listener.ora for data guard broker to use. A database link is just like a client which is trying to connect the remote database. The remote database is down. This is the most common cause of ORA-12514. The connect descriptor in the local tnsnames.ora has been changed. The service name of the remote database has been changed. Another listener is used for servicing the remote database. Usually, this type of ORA-12514 does not complain about the database link, except that you defined the database link with its own connect description. As you can see, we did not use a connect identifier, instead, we use a full connect description. Therefore, if there’s anything wrong with the connect description, we have to drop the database link then create a new one for solving ORA-12514.